Lovely stay, enjoy every moment, love the breakfast. 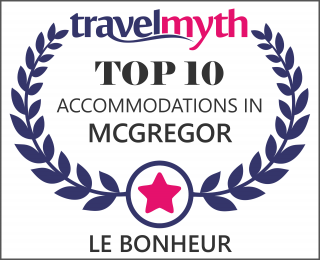 McGregor, Le Bonheur is such a special place. Private entrance and the cleaniness. Very friendly host, lets you feel very welcome. Love the breakfast – maybe a small TV, for rainy or bad weather times. Quaint village in the wine region of the Western Cape. Special banting friendly breakfast supplied with pleasure. Martin and Jenny even joined us most mornings. Home away from home! Most delightful place to stay with everything you can think of. Amazing hosts who make you feel so well taken care of, I didn’t want to leave! Perfect for a couple looking for a base to explore from in McGregor! Lots of attention to detail and loved the breakfast in the tray left outside our door on the patio table every morning, Best savoury muffins ever, #breakfastinbed! No TV in room, not sure if this was really a negative. Die Inhaberin ist sehr nett und hat uns schon im Vorfeld eine Mail mit Informationen, Restaurant-Tipps und ähnlichem geschickt uns uns damit zu zwei sehr leckeren Abendessen verholfen! Haus und Garten sind liebevoll hergerichtet und man kann sich wirklich wie zuhause fühlen. Als einzige Kleinigkeit mag ich persönlich blickdichte Badezimmertüren, aber das liegt ja im Auge des Betrachters….. Man sollte beachten, dass das Frühstück gesondert besucht werden muss, zumal die morgendlichen Möglichkeiten im Ort sehr begrenzt sind. Very relaxing. Just remember to pre-book restaurants. Friendly owners. Tasty breakfasts. Nice and private. A beautiful refreshing guesthouse perfectly located and welcoming guest – what more do you want! Le Bonheur is perfectly located, close to restaurants, etc yet far enough for a relaxed quiet atmosphere. The hosts were very welcoming and accommodating. 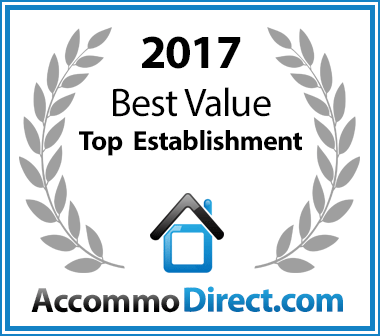 The accommodation was lovely, nice bed linen with a very comfortable bed, the bathroom nice a spacious – all in all a lovely homely feel. Lovely relaxed atmosphere with interesting and friendly hosts. Really comfortable lovely room is a lovely little town. Hosts were brilliant and provided a delicious, light breakfast on the veranda over-looking the hills. 5-ster-verblyf in die hartjie van McGregor. Top verblyf, top gasvryheid en top ontbyt. Kan nie hier verkeerd gaan nie. · Rustigheid homself, `n wegbreek uit die stadslewe tussen mense wat mens net weer en weer wil sien.Die eienaars is wónderlik! Dis `n fees om daar te bly van die sekonde wat jy deur die voordeur kom. Uitstekende fasiliteite en alles is stapafstand van waar jy wil wees. Was great! · Vriendelike en behulpsame gashere. Lovely stay made so much more comfortable by a super host and hostess. Most enjoyable few nights in the quaint village. Nothing is too much trouble for our hosts, great stay. · ‘n Baie verrassende, aangename en ontspanne besoek. My vrou en ek het 2 nagte in Oktober by Le Bonheur deurgebring. Die blyplek was netjies, skoon en keurig. Die gasvryheid was warm en uit die boonste rakke. Dit is goed geleë en stapafstand van al die belangrike plekke in die dorp. Ons is in ons 60’s en dit was die ideale verblyf vir ons. Ons gaan weer daar kuier. · So lekker ek wil permanent daar bly! Vriendelike, behulpsame professionele diens. Ons kom weer! · Lekker mense, pragtige plek, kamer benodig net lugversorging. Ons is hartlik ontvang. Die plek is baie mooi, maar ongelukkig het ons die hittegolf oor Nuwejaar gevang. Die kamer is goed toegerus vir winter met ondervloerse verhitting.